David Price: the next BIG (and we mean BIG) thing? Those fans of heavyweight boxing in the UK and elsewhere turned off by the current (overblown, in our opinion) controversy regarding the Dereck “Del Boy” Chisora and David Haye matchup will find respite this Saturday night as rising British star David Price (12-0, 10 KOs) goes up against sturdy challenger Sam Sexton (15-2, 6 KOs) in Liverpool, England. Veteran British fight promoter Frank Maloney-—a rival of the man putting on the Haye-Chisora grudge fight, Frank Warren—has been busy in the lead-up to this scrap for the British and Commonwealth heavyweight titles (recently vacated by Tyson Fury when a fight with Price couldn’t be agreed upon), promoting the genial 6’8” tall giant Price as the anti-Chisora/Haye/Fury of UK boxing. Price tends to avoid trash talk and likes to let his fists speak for him in the ring. “David and Sam are both gentlemen and will give fans a fight to remember, “ says Maloney. “There has been no trash talking and whoever wins will be proud to call themselves British and Commonwealth champion. “[Tyson] Fury tried to lessen the title by refusing to face David. Chisora and Haye have brought bad publicity to the sport. Price himself says that the buzz about him at home has grown so deafening that he escaped to the quiet of Germany to train for the Sexton fight. “I needed to get away because there are a few distractions at home in the city. A lot more people want me to be here, there and everywhere,” says Price. “It is nice to know you are in demand, but training is the most important thing so I had to get away and focus. While Price impressed many last time out with a first round destruction of rugged John McDermott, one observer who wasn’t moved by the fight was none other than his rival, the ever-opinionated Mr. Fury. “He’s a bum,” Fury says of Price. While there has been a lot of moaning from Frank Maloney and others in the boxing business re the Haye versus Chisora grudge feud scheduled for July 14 in London, England, two different polls this week show that the boxing public is massively in favor of the fight taking place. A poll in Boxing News showed 75 percent of respondents in favor of the bout, while another in the Daily Mail had the pro-fight faction at 71 percent. Closer to home, American heavyweight contender Franklin “Ya Ya” Lawrence takes on Mike Mollo for the vacant NABA heavyweight title this Friday night at the Dover Downs Hotel & Casino, Dover, Delaware. Lawrence (17-2-2, 12 KOs), coming off of five straight wins, sounds very confident, if not downright arrogant, as he takes on a man who hasn’t fought since 2010. “Andrew Golota boxed him and then beat him half to death. Lawrence is also convinced that the heavyweight titles held by the Brothers Klitschko are soon to be his. “I will be fighting for the championship within a fight or two. My ratings would be higher except the guys ahead of me are ducking me,” Lawrence contends. Mollo (20-3-1, 12 KO’s), however, is unimpressed by Lawrence’s future plans, which he sees as delusions of grandeur, and says he’ll upset “Ya Ya’s” apple cart with a win on Friday night. “Not only am I going to win but I will win in spectacular fashion,” Mollo vows. “I have been putting in the hard work and have been in training camp for ten weeks. “[Lawrence] beat an out of shape Jason Gavern and Jason Estrada. He has gotten off easy in those fights and if he wants to live off that, then he is fooling himself. If the fight is as heated as the trash talk, this should be a good one. The Return of Razor Ruddock? Speaking of delusions of grandeur, you may have heard of the press release making the rounds announcing the return of former contender Donovan “Razor” Ruddock (38-5-1, 29 KOs). Ruddock joins the ranks of Jameel “Big Time” McCline, Evander Holyfield, James “Lights Out” Toney, and Antonio Tarver, all 40+ aged fighters who are looking for that coveted (and lucrative) shot at one or both of the heavyweight kingpin Klitschko brothers. “First thing, I want my Canadian Heavyweight title back,” says Ruddock. “I really respect Neven [Pajkic, current Canadian Heavyweight champion]. “He’s a warrior who carries the title with class and pride. But, sadly for him, he’s wearing the belt that I want. “Then when Neven is healing up, hopefully he’ll take some comfort in the fact that I’ll be putting Tyson Fury, Chris Arreola, Derrick Chisora, David Haye, Bermane Stiverne, Seth Mitchell, and Tomasz Adamek, on the exact same pudding diet too. “And after I feast on the appetizers, I’ll dive in for two helpings of Chicken Kiev,” says Ruddock in a reference to the Ukrainian champions. Power Shots contacted Canadian champion Pajkic regarding Ruddock’s grandiose remarks, and he didn’t seem too impressed with the 48-year-old former contender’s big plans. Another heavyweight who is never lacking in the trash talk department, Kevin “Kingpin” Johnson, is already yapping ahead of the Betfair Prizefighter International Heavyweights tournament set for Wednesday June 20 at York Hall, Bethnal Green in the UK. 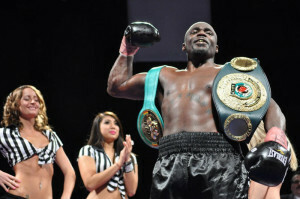 Johnson made a move back toward heavyweight relevance recently when he disposed of Aussie heavyweight contender Alex Leapai, stopping him via a ninth-round TKO. And that’s all Johnson needed to start talking very big once again. “I’m ready to put the American heavyweight boxing scene back on the map starting with the Betfair Prizefighter tournament on June 20,” Johnson says. Power Shots has to wonder: has Kevin Johnson been talking to Razor Ruddock, by any chance? Heavyweight contender Alex “The Lionheart” Leapai recently told the world that he was ready for the Klitschko brothers. As it turns out, the Australian-based, Samoan-born fighter wasn’t even ready for one of the Klitschko’s victims. Perhaps guilty of looking past his next opponent, Leapai was taken out in the ninth round on Sunday by American Kevin “Kingpin” Johnson at the Doomben Racecourse, Ascot, Queensland, Australia. In recent interviews, Leapai (25-4-3, 20 KOs) had promoted the idea that he was the next Mike Tyson, but after two strong opening rounds, he was outboxed and finally outslugged by the man who earned the derisive nickname “Safety Pin” for his anemic 2009 performance against WBC champion Vitali Klitschko. Johnson (26-1-1, 12 KOs) strafed Leapai with vicious uppercuts to the body in the ninth round, then moved to the head and caught him flush with a right hand. Leapai took a standing eight count and bravely tried to continue, but he got trapped in his corner, with Johnson again hitting him at will, and his team waved the white flag at 2:22 of the ninth round. Leapai is the only the most recent Samoan heavyweight from Down Under to suffer a devastating loss at the hands of an American foe. The recently retired David “Tuamanator” Tua saw his title aspirations ended for good with a unanimous decision loss to Monte “Two Gunz” Barrett in 2011. Leapai will no doubt continue his career, but his first taste of elite level competition proved that he has a long way to go before his dream of fighting the world champions can come true.